Pet Pesticide Bottles find their wide uses in Pharma, Retail and Packaging industries. 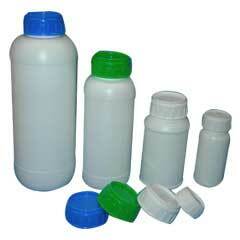 The Pet Pesticide Bottles are highly popular among the clients because of the perfect finish and quality. The high-grade raw materials like Pre Form and advanced machinery are used for manufacturing the products. Customized packaging facility is provided as per the requests of the clients.